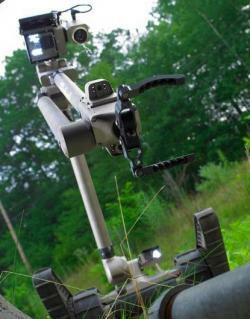 Nabbing terrorists: Robotics experts are analyzing how automated devices played a part in apprehending the Boston Marathon bombers.Courtesy MashableLaw enforcement authorities aren't giving out specific information, but robotic experts are chiming in with their thoughts on how robots played a role in capturing the Boston Marathon bombers. 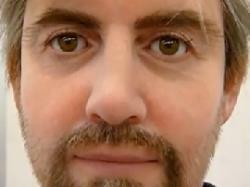 Here's a pretty interesting online article theorizing the use of robots in the case. The link includes a video that shows how these robots do their jobs. While TV reports Friday night said that a robotic arm was used to pull the tarp off the boat where the second suspect was hiding, those reports, have now been called incorrect. What do you think about using robots to handle dangerous tasks involving terrorism and crime? A helpless astronaut is attacked by robospheres: Or not. But I don't believe for a second that Red, Blue, and Orange aren't thinking about it.Courtesy NASAHistory has shown us time and time again that careless exploration of backronyms can be a dangerous mistake. Think of Sir Isaac Newton, who had a mild stroke while constructing his theory of Green Round Apples Veer Inward To Dang. Or consider the vicious beating Roald Dahl received after founding his youth literacy and mentoring program, Real Everyday Adults Delivering Intelligence Not Gum. Constructing an acronym to fit an already decided upon word or phrase is a process fraught with the threat of physical harm (or, at the very least, mild embarrassment). Thank goodness for the ironically straightforwardly acronymed NASA and MIT, who are braving the field of wild, retroactively applied acronyms so the rest of us don’t have to. 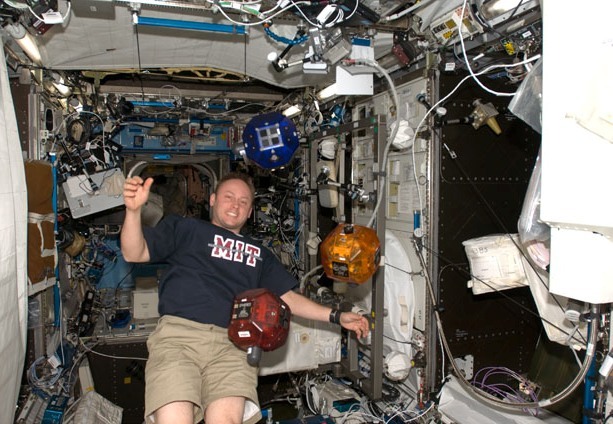 NASA’s and MIT’s current research in the field centers on its SPHERES project. SPHERES stands for “Synchronized Position Hold, Engage, Reorient, Experimental Satellites.” Or perhaps it’s the other way around. For the time being, NASA is attempting to sneak up on the principles of causation by pretending that it was a coincidence. In addition to stressing linguistic credibility to the extent that its breaking point may become clear, the SPHERES project has a physical component with secondary objectives. SPHERES is actually composed of three separate robots, each about the size and shape of a bowling ball (get it?! “SPHERES”?!) The robots will be taken to the International Space Station, where they’ll just kind of float around together. Or, I guess, they won’t just be floating around. I mean, if you’re in space and not tied down, you’ll float around. But if you, like the SPHERES robots, have your own onboard power supply (AA batteries), navigation and propulsion system (CO2 jets), and computer system, you can do a lot more than just float. The SPHERES robots will practice flying around the ISS in tightly controlled formation with each other. I suppose it doesn’t sound all that tricky—after all, dumb ol’ birds can fly in formation, and they’re dumb. But, then again, birds have evolved for millions of years to do that sort of thing, and being in space—where there really isn’t a true “up” or “down”—presents its own challenges. These simple little robots have to coordinate with each other and their surroundings perfectly to stay in formation. And once they (that is, the people that make and program the robots) get the hang of that, there are some pretty slick applications for objects in space that can automatically stay in perfect formation. For one, it should make the processes of servicing, re-supplying, reconfiguring, and upgrading the ISS and other space systems easier, because these things all involve two or more extremely expensive floating objects that need to be oriented just right to get a job done and avoid smashing each other up while doing it. Also, it turns out that a formation of itty-bitty satellites (sort of like the SPHERES spheres) can do some of the work of a much bigger, more expensive satellite. For example, instead of using a satellite telescope that relies on one huge mirror, a formation of lots of small satellites could gather bits of light that could be put together into an image. That way, if one small satellite was damaged, it wouldn’t wreck the whole project. Also, the formation of satellites could potentially be larger than a single mirror (or mirror array on one satellite). 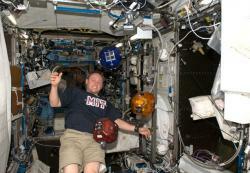 For more pictures of the spheres floating in the ISS, scroll to the bottom of this page. *This paragraph contains no NASA endorsed ideas. It just seems to me like the obvious thing to do. Yeah, that's the future looking back at youCourtesy GeminoidDKUh oh. The future is trying to break down our doors again, and it's using its favorite tool. No, not lasers—robots! Filthy robots. Robots, who steal our jobs and our women (or our men, whichever makes you angrier). Robots, who get more advanced with each passing year, until one day, as sure as the sunrise, they will go Skynet all over us. They will take everything that was ours. They will take our jobs, our mortgages, our more demanding pets, our horticultural chores, and humans will be relegated to a million lifetimes of lying on beaches and surviving off the food that robots cook but cannot eat. The end of history. As the man said, "That's it, man! Game over, man, game over!" We humans have a few years left as the top dogs, but certainly not many. As you can see in the video below, robots have already advanced to the point where they can do many of the things babies can—smile, blink, twitch, look stupid—and at least one thing babies can't do: grow beards. Remember Big Dog, DARPA's new robotic pack carrying robot? Now, Little Dog shows off, navigating rough terrain and obstacles. Our first National Robotics Week (April 10 - April 18) ends today. Created by congress just last month, the National Robotics Week celebrations will help inspire students of all ages to pursue careers in robotics and other STEM (Science, Technology, Engineering, and Math) related fields. This blog, sciencebuzz.org, has dozens of entries about how robotics are used in healthcare, manufacturing, transportation, and national defense. Botfest non-competitive exhibition in which robotics enthusiasts can show off their creations. Botball teams design robots for ball playing competion. Remember the four legged robotic pack animal "BigDog"? Now a two legged version called "PetMan" is almost ready to carry your stuff. 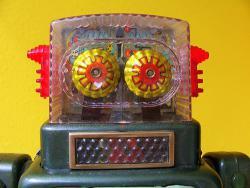 Robots are watching you go to the bathroom… if you keep your robots in the bathroom. Bathroom-bot doesn't like what it sees: But it's not about what Bathroom-bot likes.Courtesy thewhitestdogaliveI do. That is, I keep robots in my bathroom. I have a modified Teddy Ruxpin with a webcam erupting from its mouth perched on the edge of my sink, pointed toward the toilet. That might sound a little weird, but it makes sense if you think about it. See, if I’m ever wondering whether or not I am currently using the toilet, I can log onto the internet, and check out that webcam. If I don’t appear to be on the toilet, I must be at work, or some other place with a computer, like a public library. But if I’m wondering if I am currently using the toilet, and discover that I am unable to access my webcam via the internet, I must actually be using the toilet, where there is no computer. Easy! It’s a simple way of keeping on top of what’s happening in my life. Buuuuut… It turns out that the many wireless, web-enabled devices you surely have in your homes can turn against you with the help of hackers. This includes your TiVo, your parents’ fancy security system, your child’s robot, and my Ruxpin toilet-watcher. Scary, right? Your little robo-helpers periodically send out packets of information to your wireless network, and if someone were in the neighborhood looking for that sort of thing, they could find out what sort of device was sending signals, and take control of it. A group of researchers at the University of Washington actually tested out several fairly common wireless gadgets, and found that it wasn’t so difficult to take them over. The damage they were able to do was limited by the fact that most wireless devices don’t really do all that much. Having the TiVo go crazy isn’t so bad, but someone else using your nanny-cam is a little disturbing. Toy robots like this little dude, which can be controlled wirelessly to roll around and take live video and audio are potentially troublesome. (On the other hand, that little robot can also play digital music, so friendlier hackers could use it to follow you around and regale you with song.) And there’s no telling who might know when I’m using my bathroom.